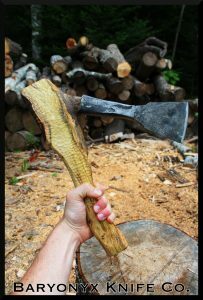 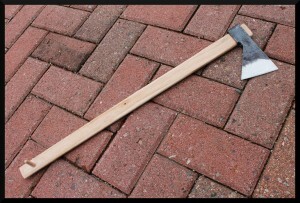 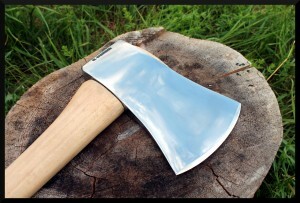 Shown here is a 350g Rinaldi “Calabria” hand axe with a modified handle. 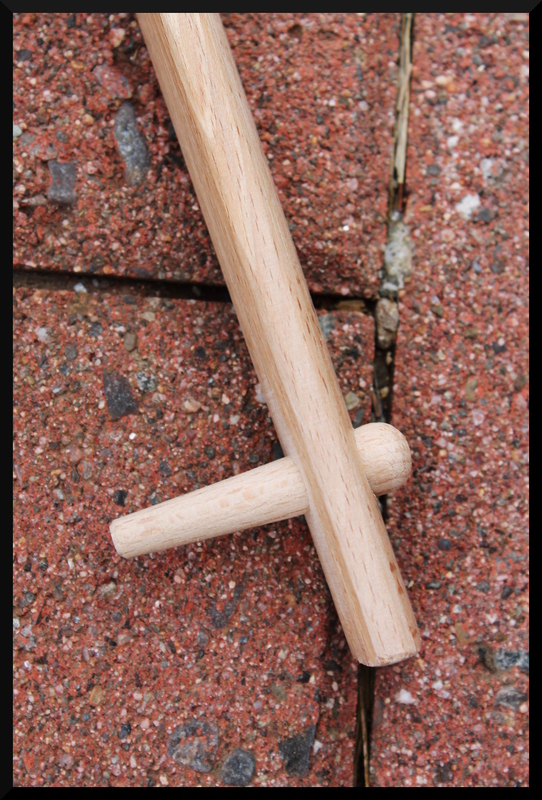 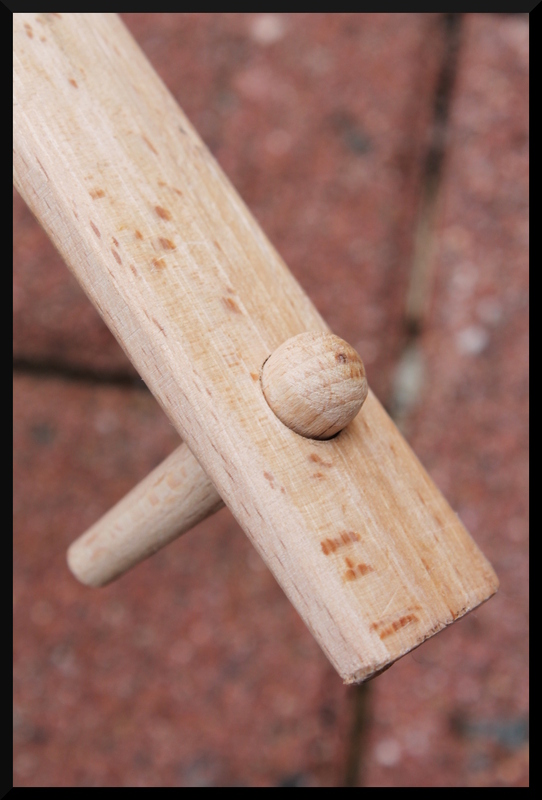 A common complaint raised regarding slip fit handles is that (despite their virtues) a knob is either small or totally absent, meaning there is little or nothing to stop the hand from slipping off the end of the handle if a loose grip is used. A simple tapered cross-pin at the end of the handle creates a removable solution to this problem. 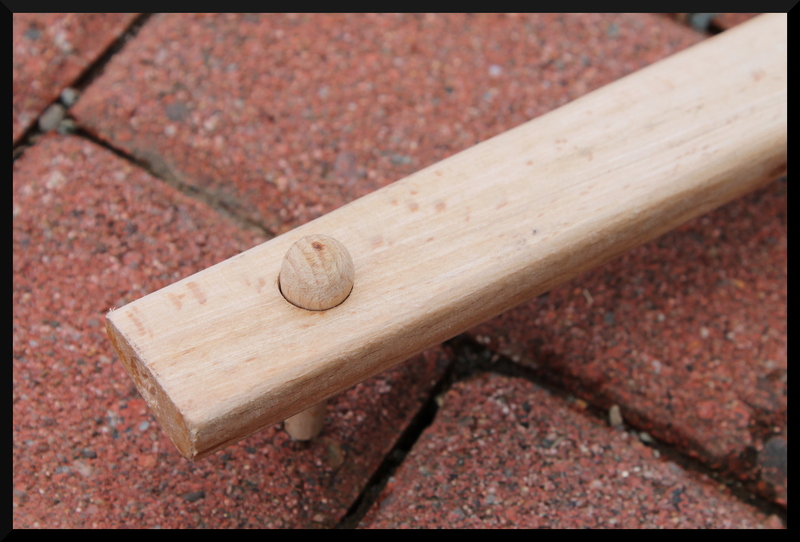 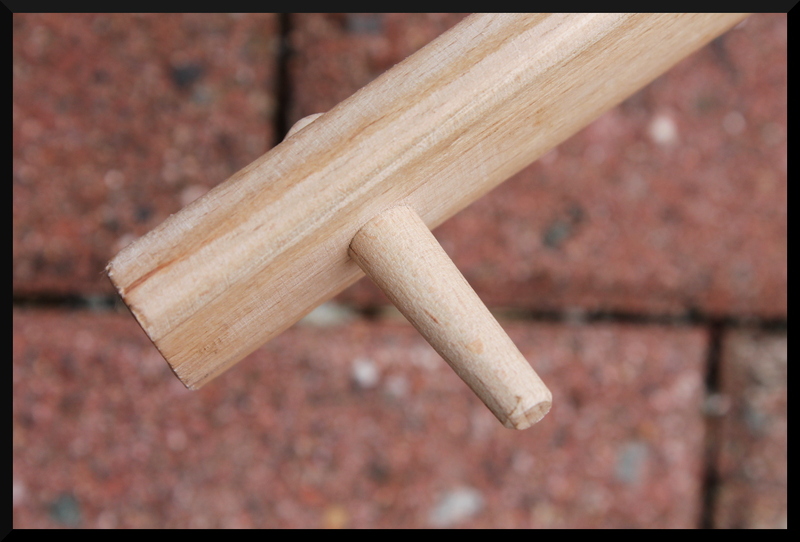 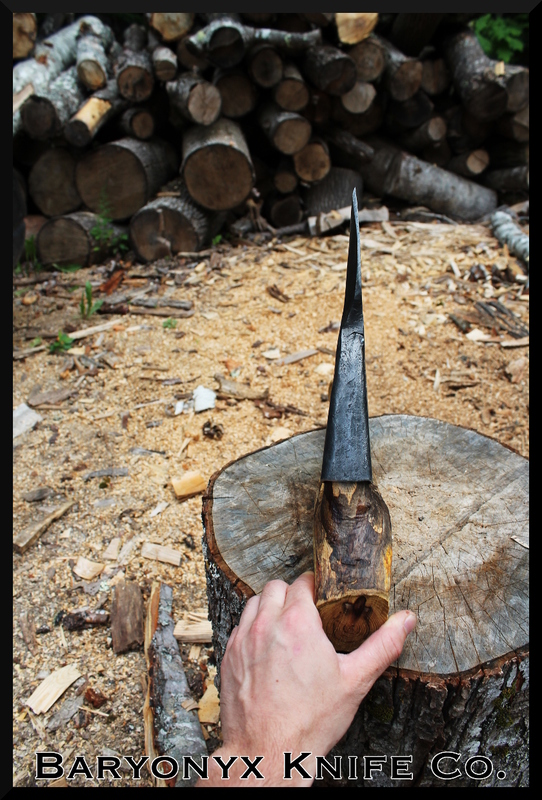 A tapered hole was bored with a small step drill and a wooden pin, tapered to match, driven into the hole. 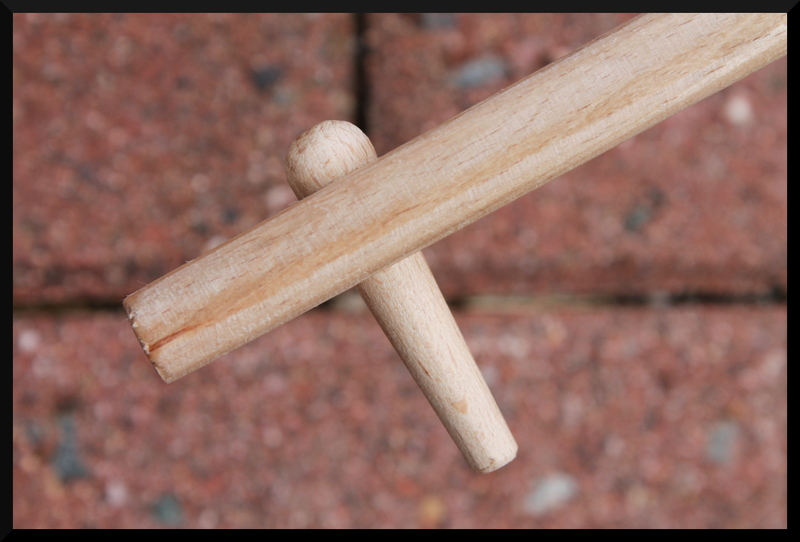 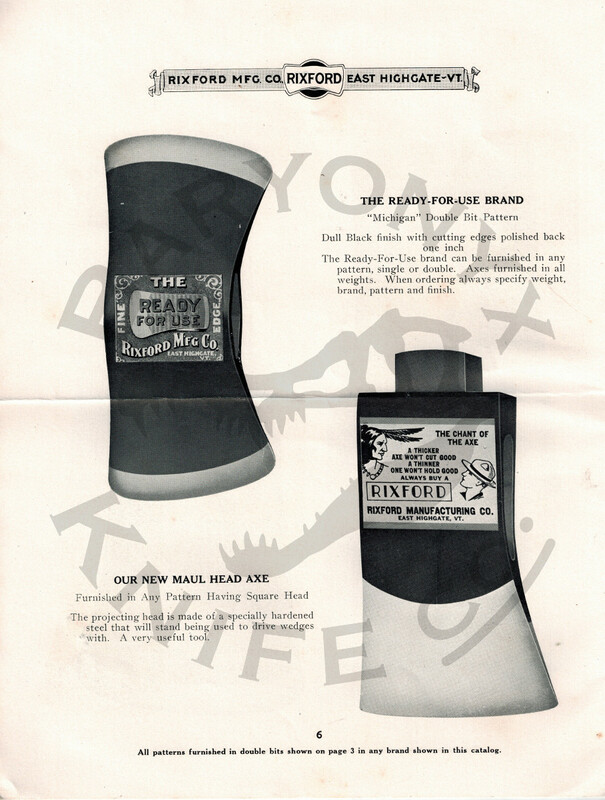 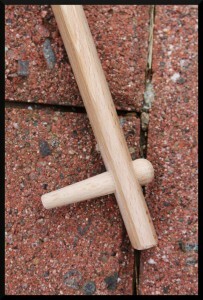 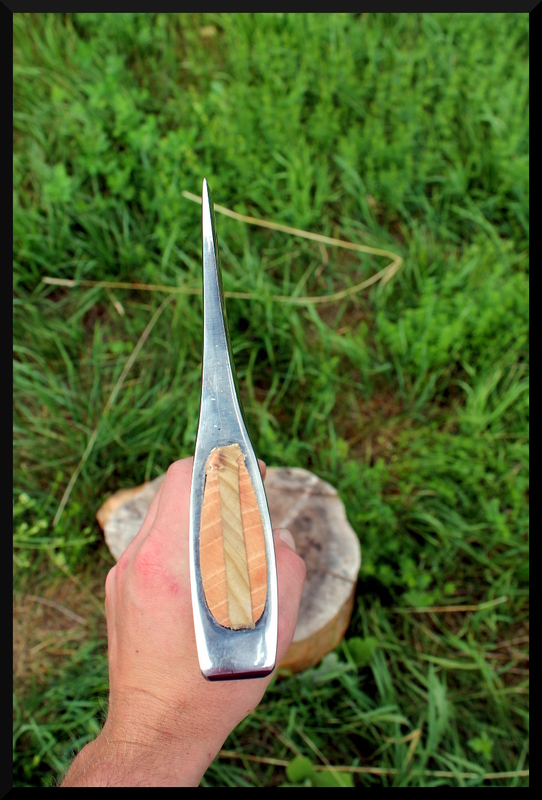 The single-sided pin with the projection to the outside of the hand is the most comfortable and secure arrangement vs. a finger-sided or double-sided projection, and if the head must be removed from the handle for use as an independent tool the wooden pin is easily driven out so it does not obstruct the removal of the head. This provides several notable advantages over the use of a lanyard: the user’s hands may slide freely along the handle as needed to adjust grip position, the handle may still be immediately released in the event of an emergency or accident, and the pin allows the end of the handle to be tucked under a belt and have it stay there nicely if the user’s hands need to be free without setting the axe on the ground. 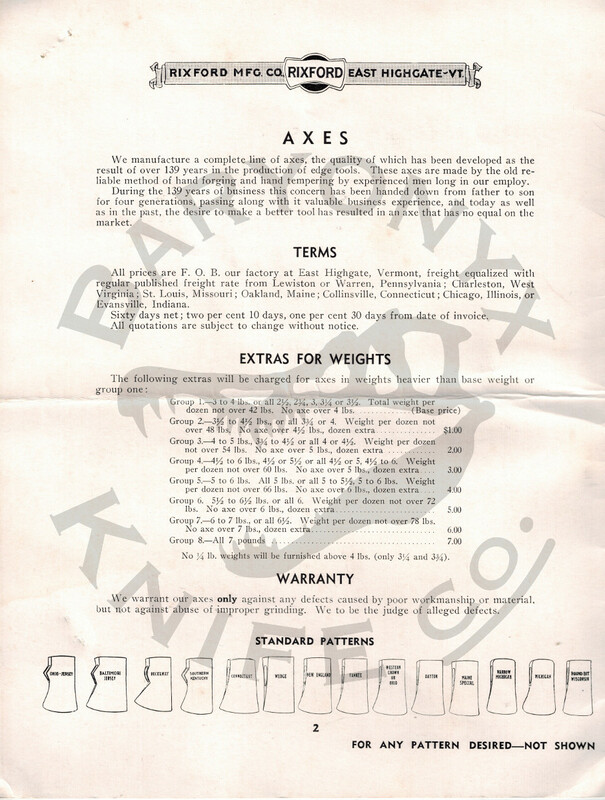 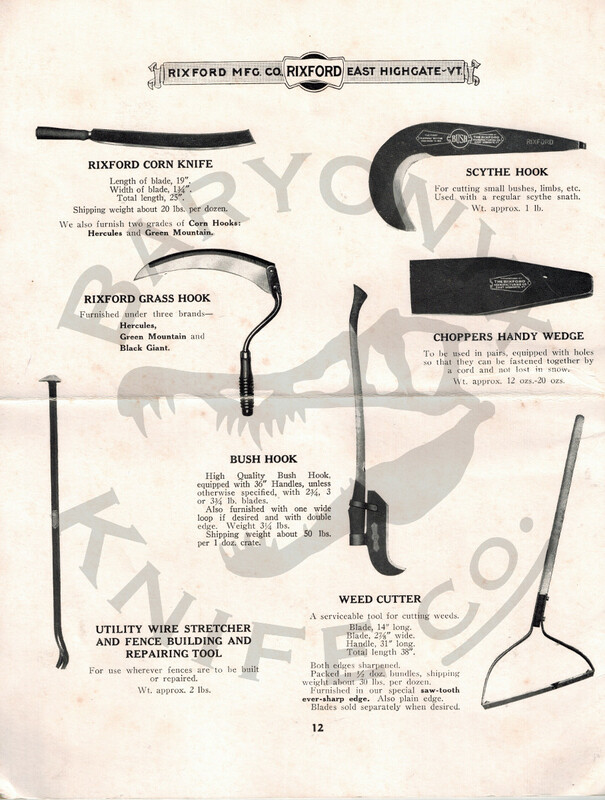 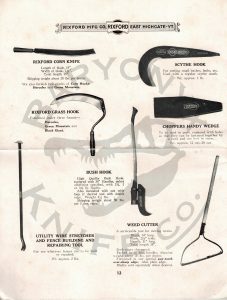 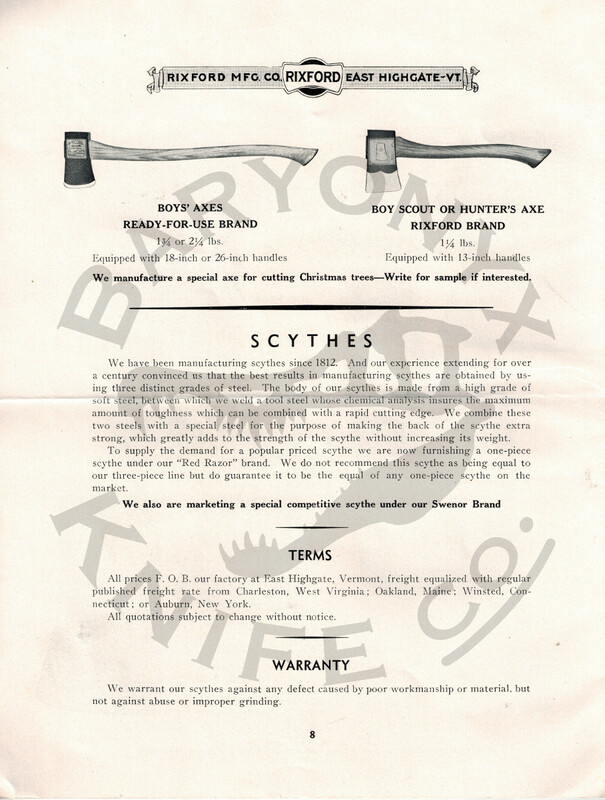 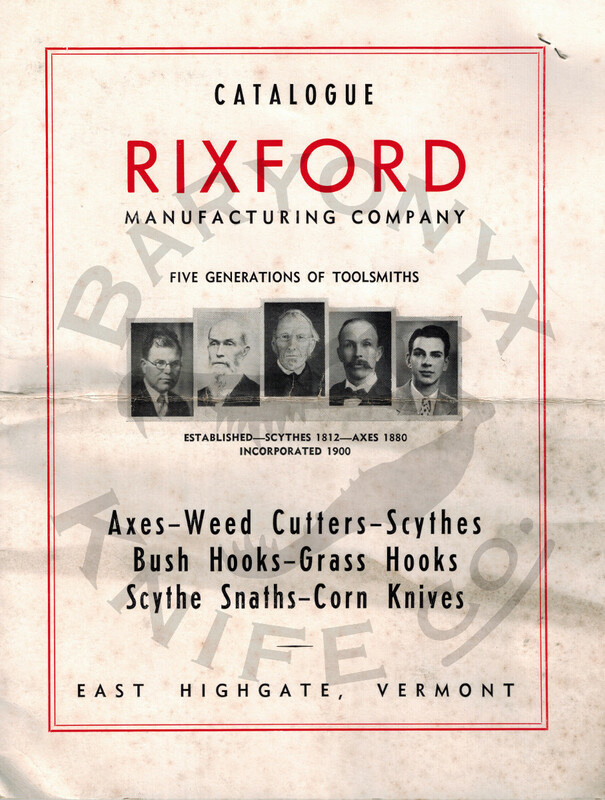 Establishing the actual balance point of asymmetric tools like scythes or axes can be fairly difficult, since the real point of balance often lies external to the body of the tool itself. 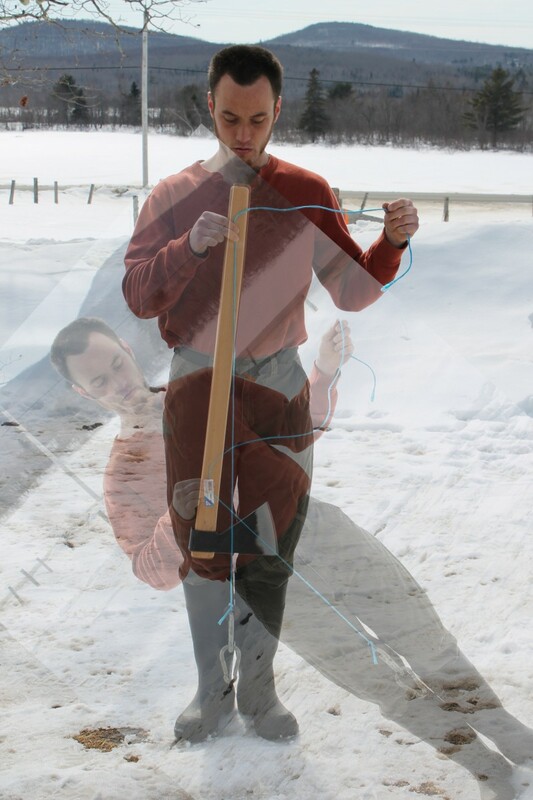 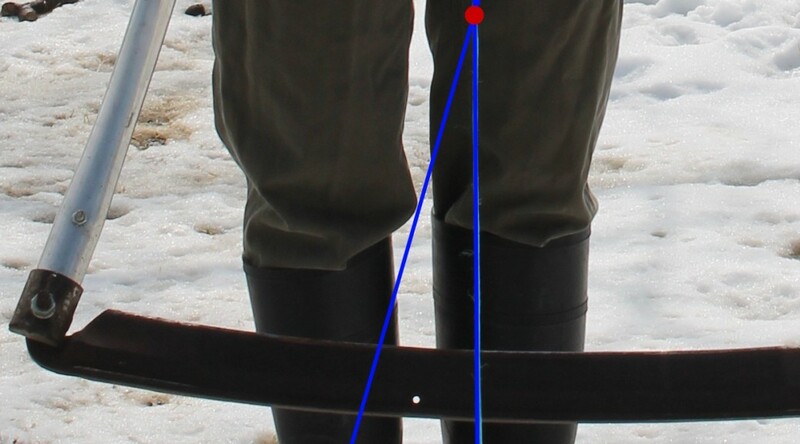 The following shows a method using a plumb line, two suspension points, and photo overlays to approximate the location of the center of gravity. Why bother with this, you ask? 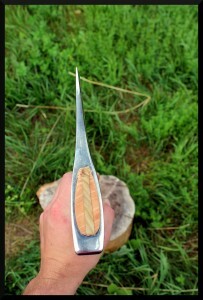 It depends on the tool. 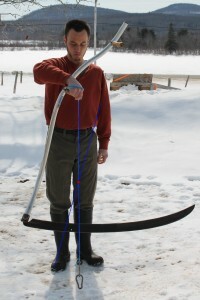 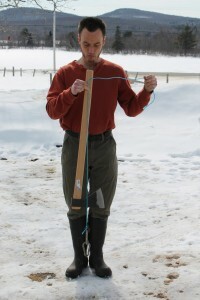 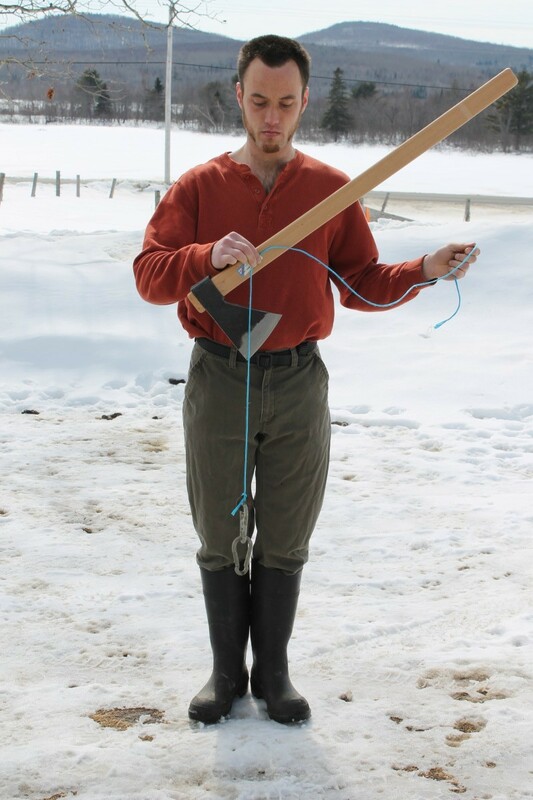 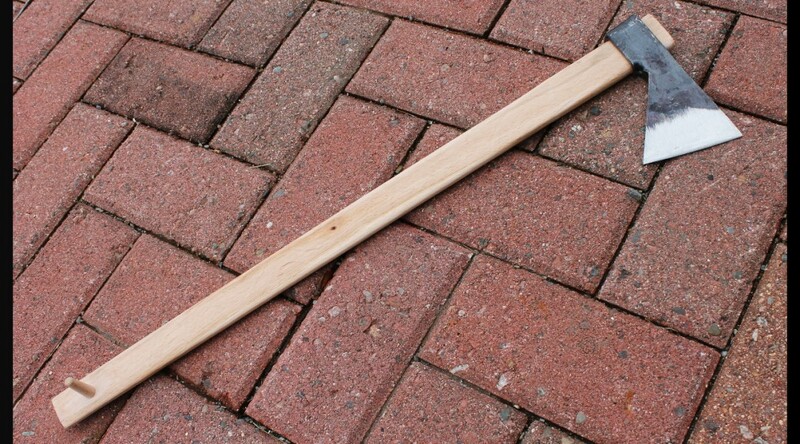 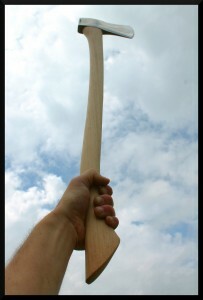 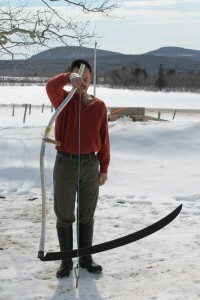 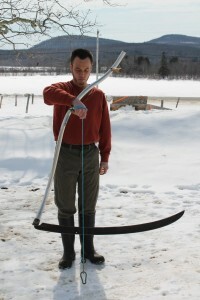 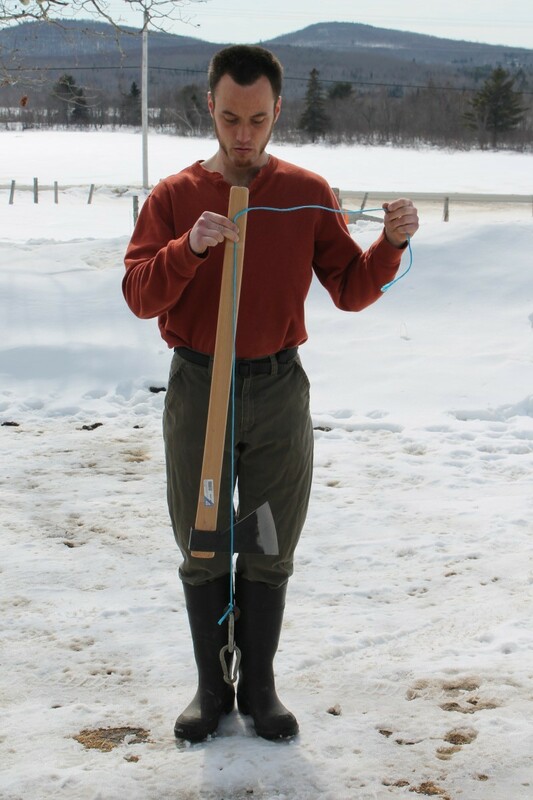 With scythes it can assist in adjusting the horizontal balance or determining the “power” of the unit relative to its overall weight, with axes it can help in determining an ideal head and handle pairing (of particular importance in axes with a minimal or totally absent poll, like the one shown here) and with both tools it can aid in establishing the proper hang of the blade/bit. 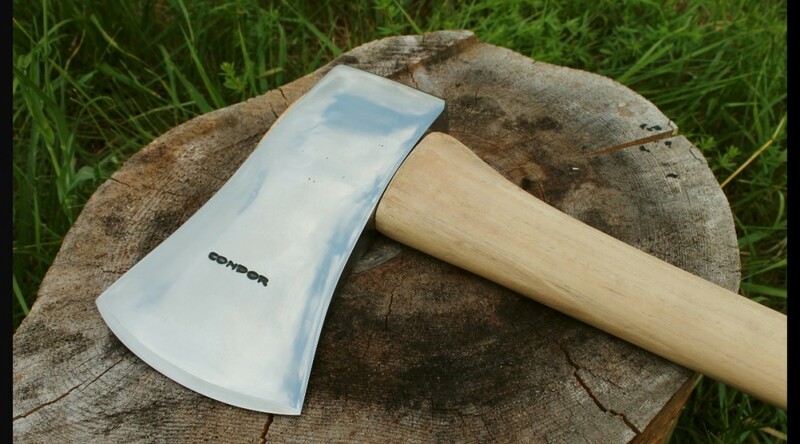 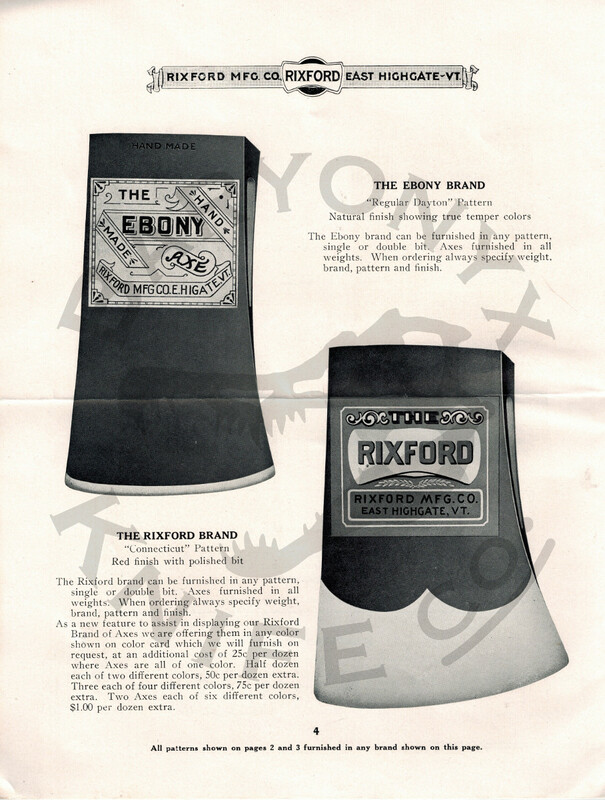 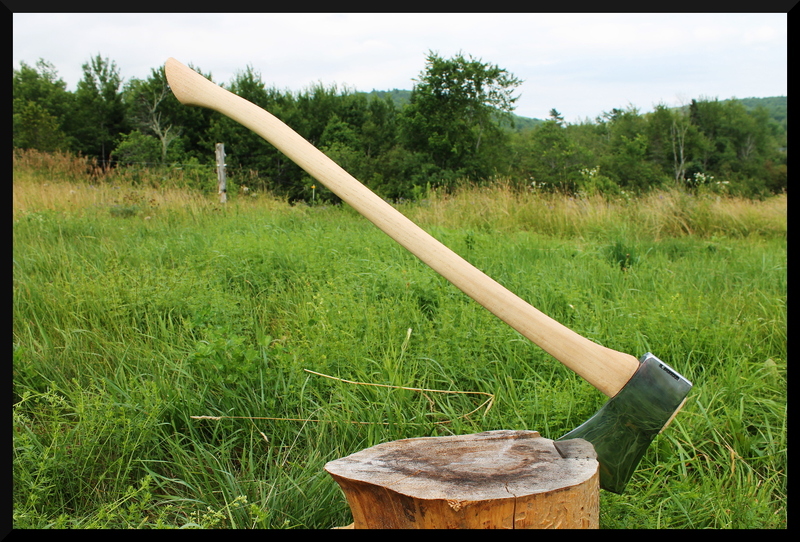 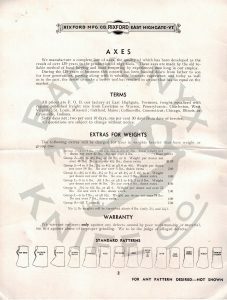 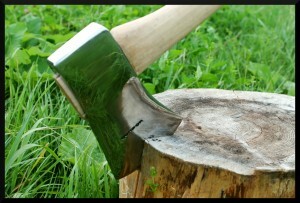 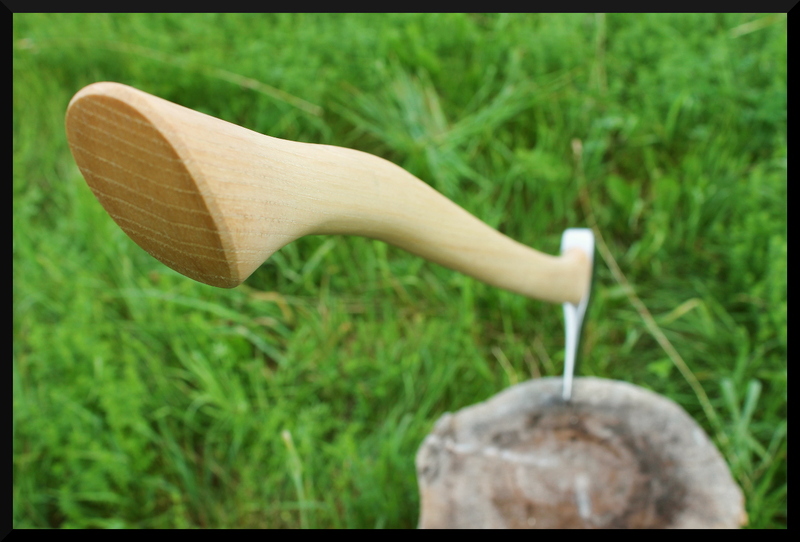 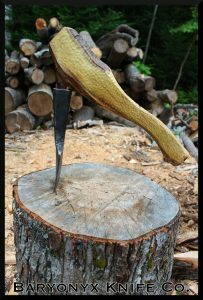 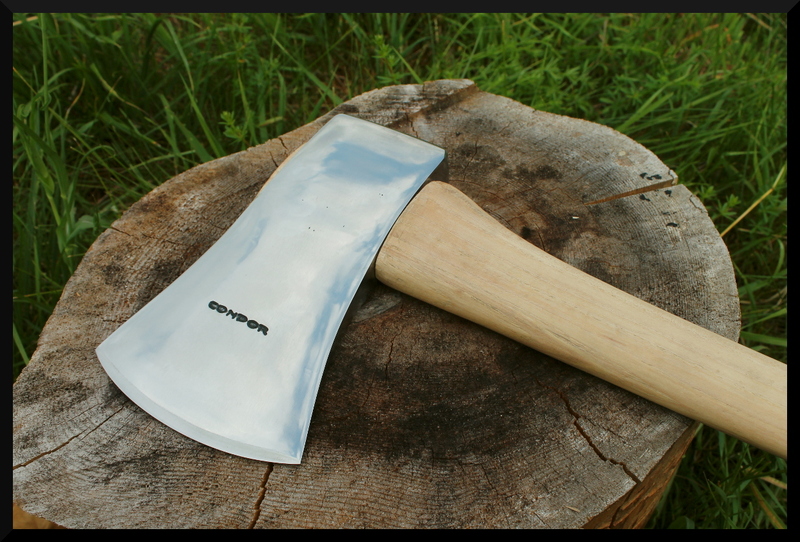 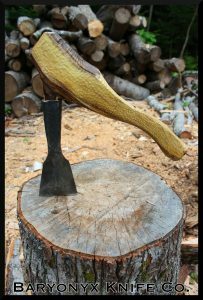 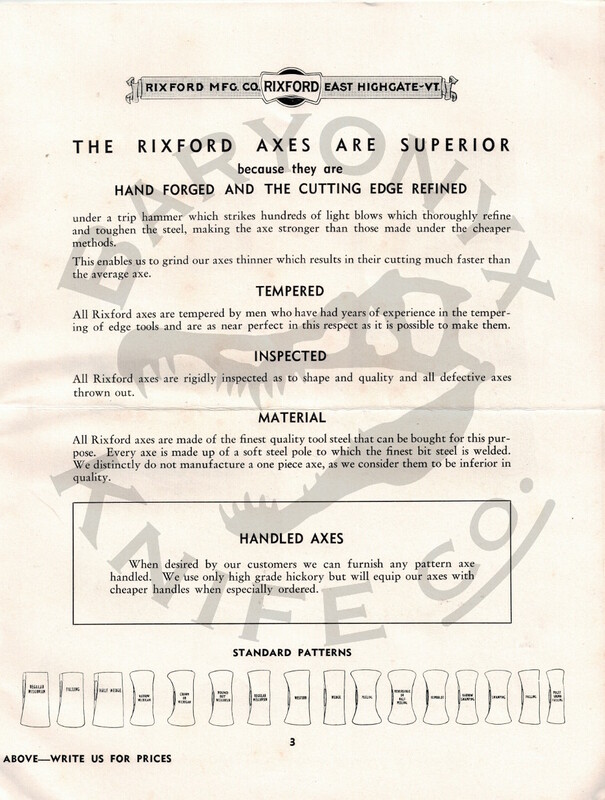 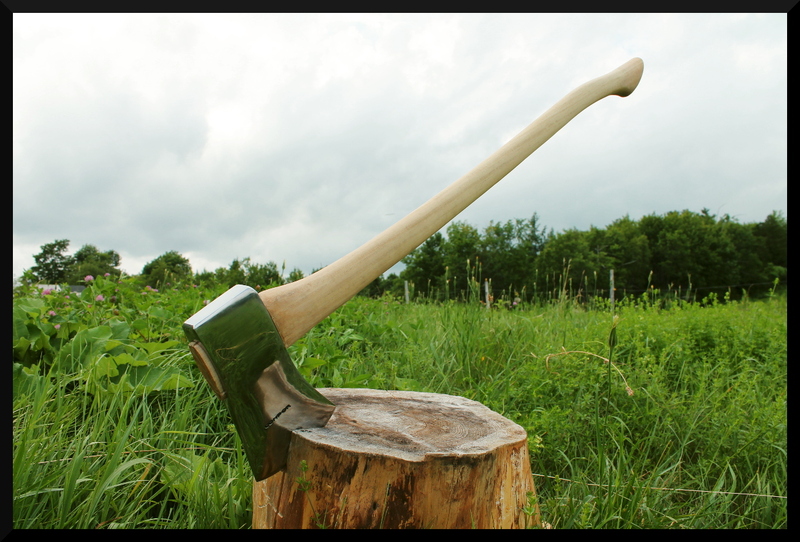 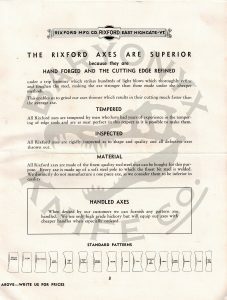 The axis of rotational balance for an axe will lie along a line passing through both the grip point and the center of gravity. Plumb line suspended from the lower nib. Plumb line suspended from upper nib. 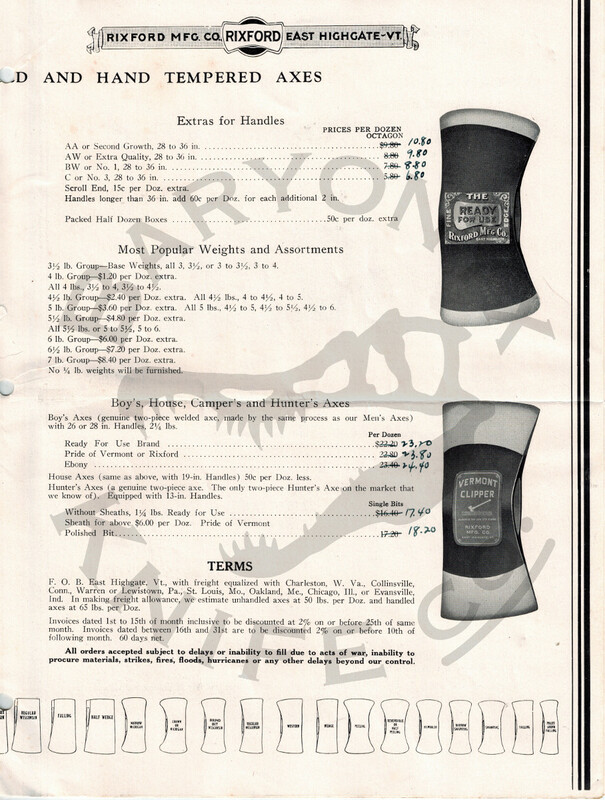 An overlay of the images, aligned as well as possible. The overlay image rotated and positioned to line up the “two” scythes. The intersection of the plumb lines is now visible. The intersection marked and the overlay removed. 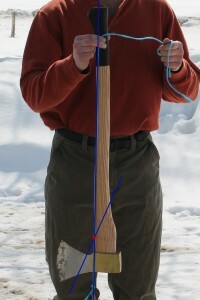 The plumb line from a suspension point at the grip, showing the axis of rotational balance during use. 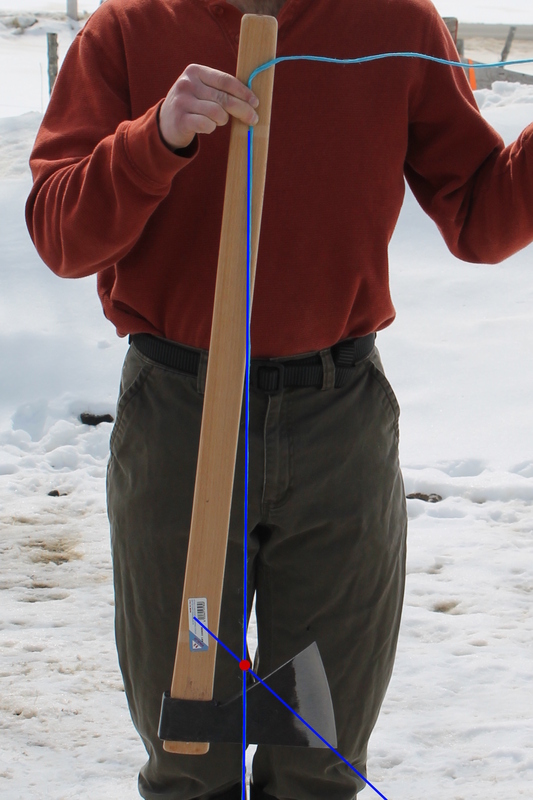 Taking a second plumb line for overlay to find the intersection. 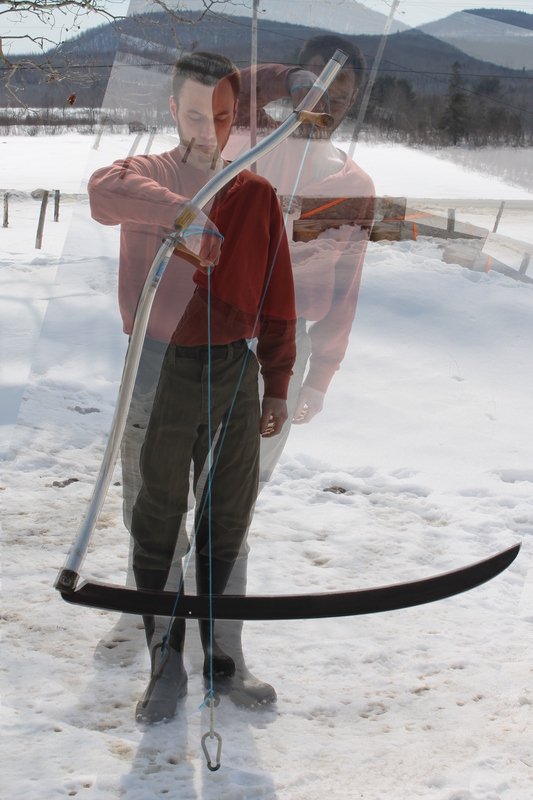 The two images overlaid to find the intersection. 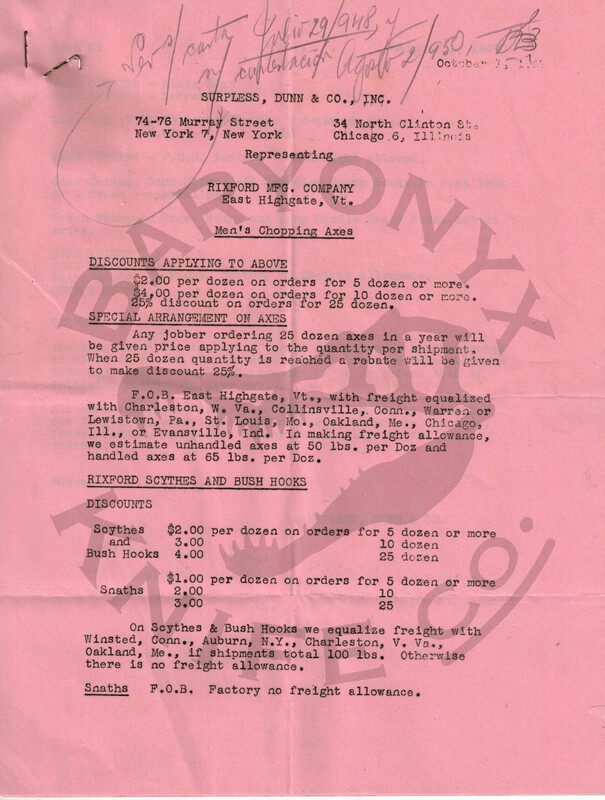 The intersecting lines marked and the overlay removed. 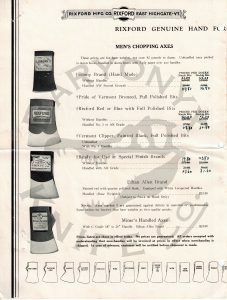 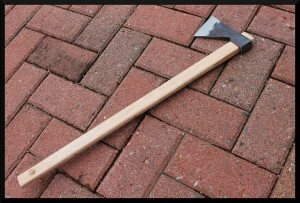 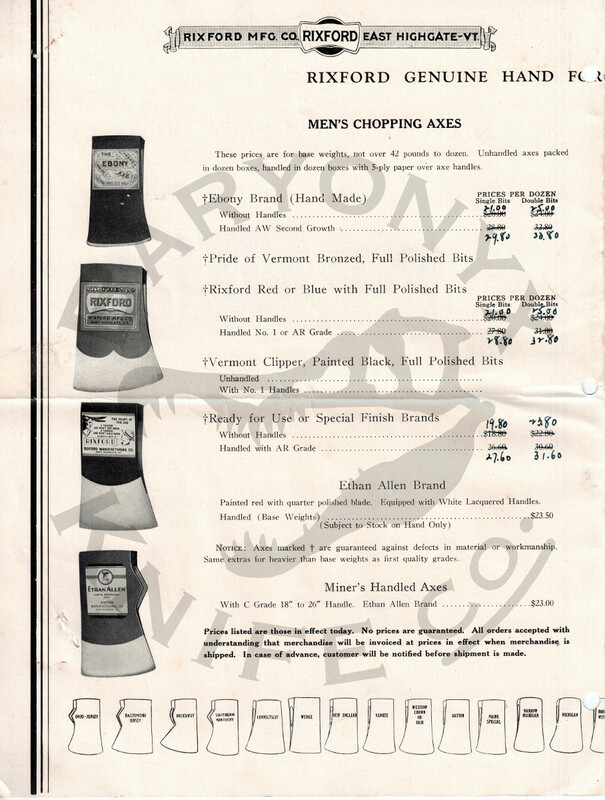 A conventional polled German axe by Adler. 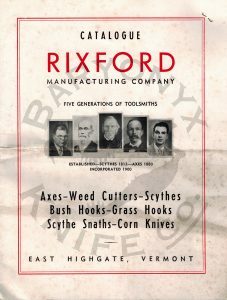 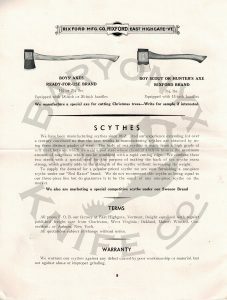 About the tools: The scythe is a vintage Beardsley grain cradle blade on a Seymour Midwest Tools No.8 aluminum snath while the axe is a Rinaldi “Calabria” Heavy Duty Axe. 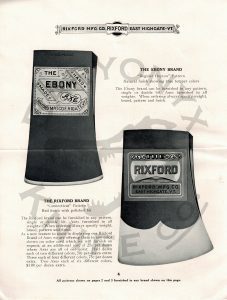 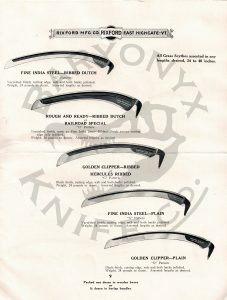 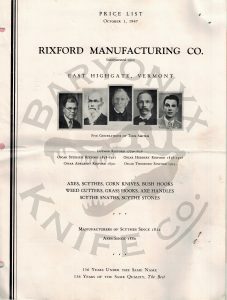 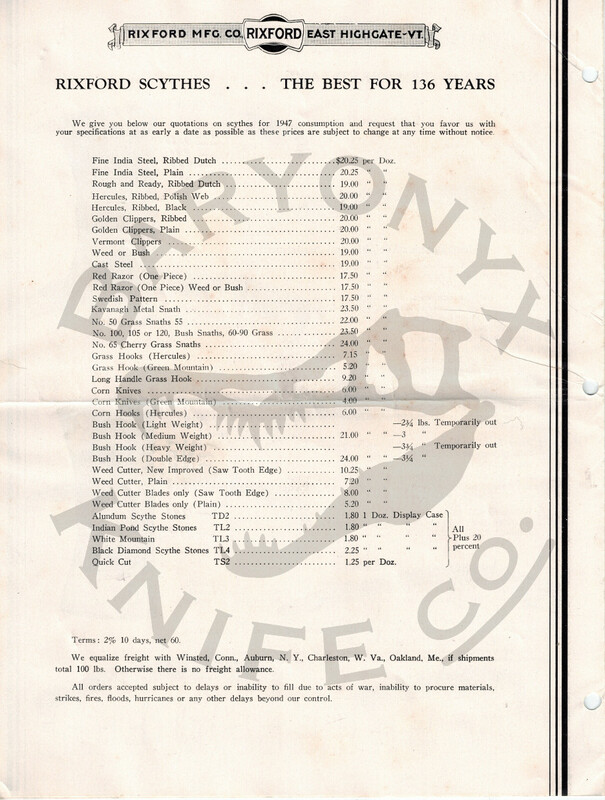 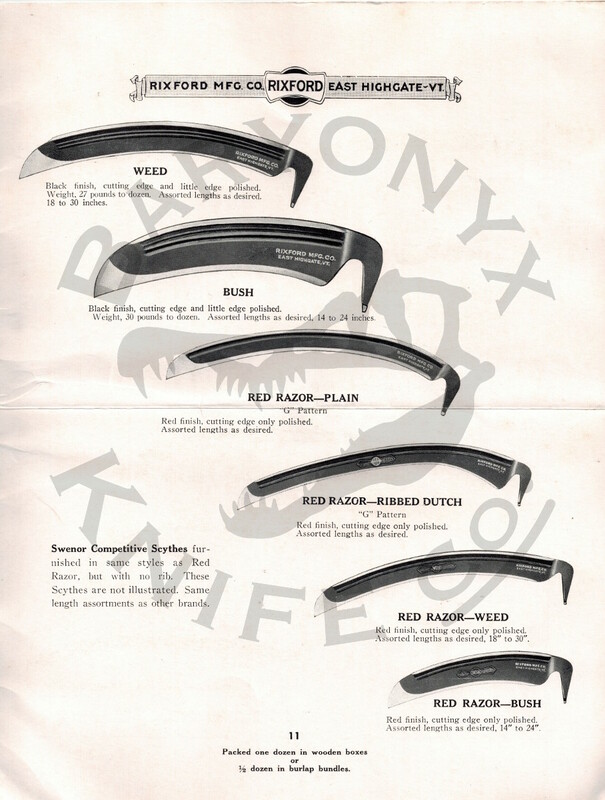 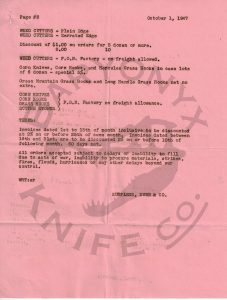 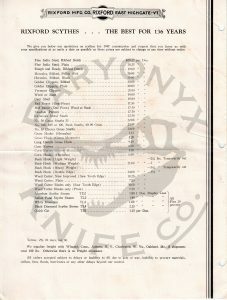 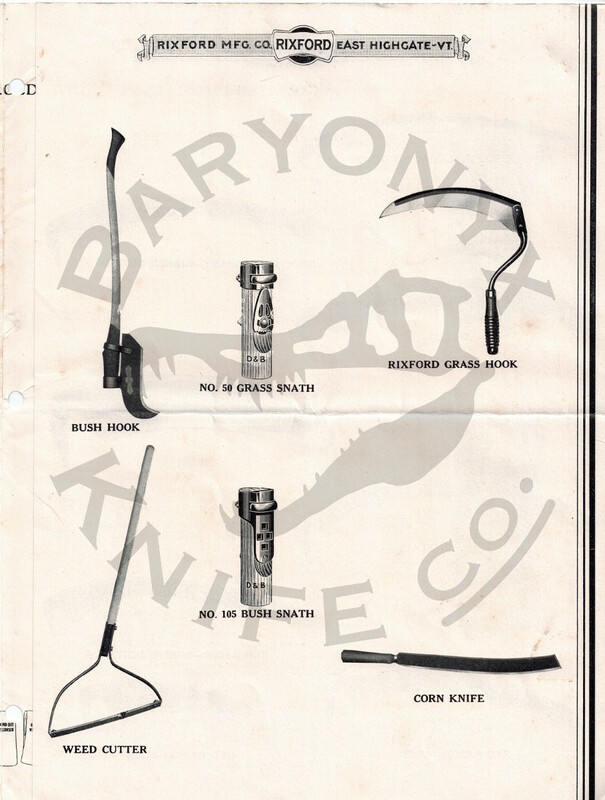 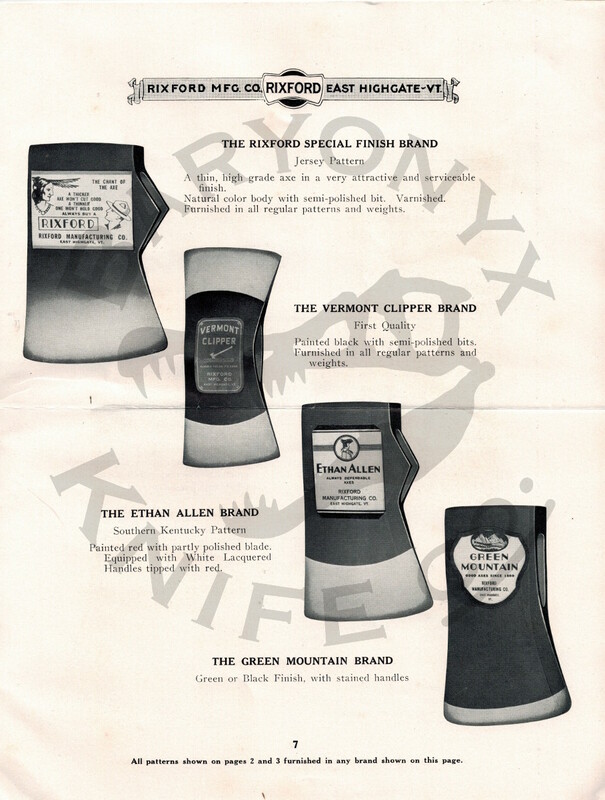 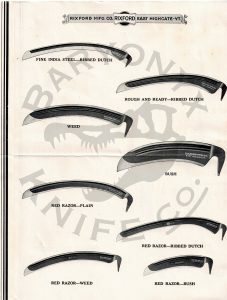 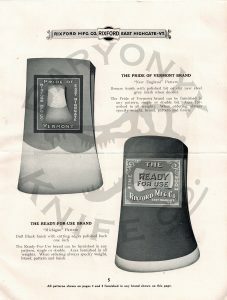 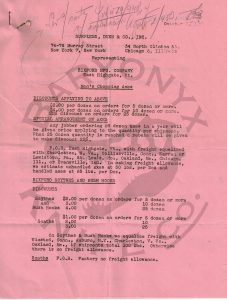 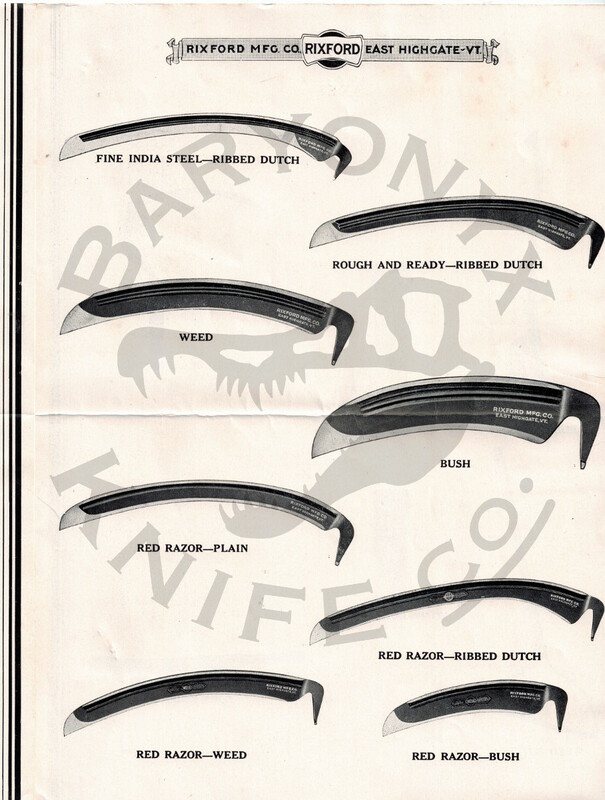 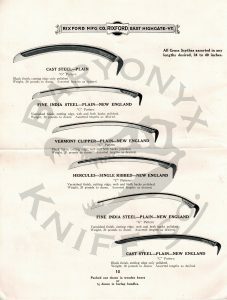 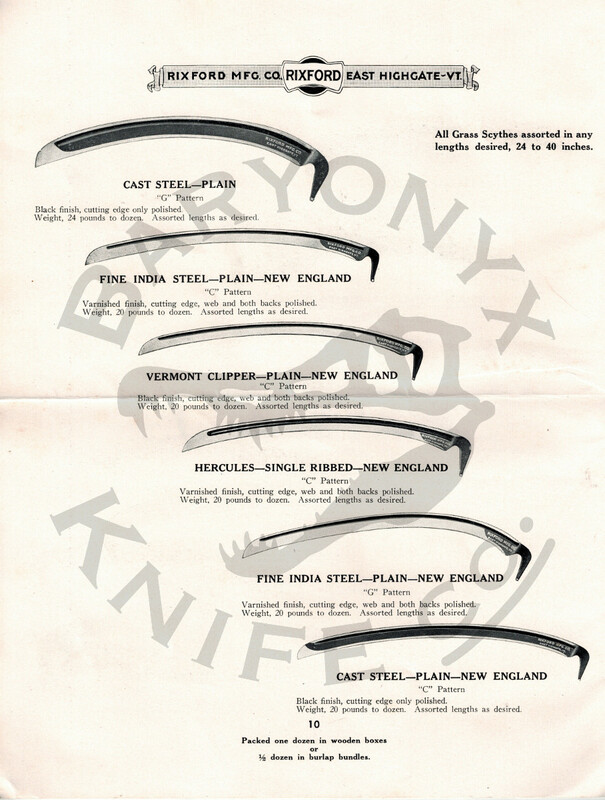 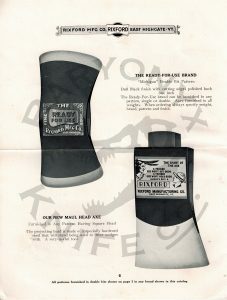 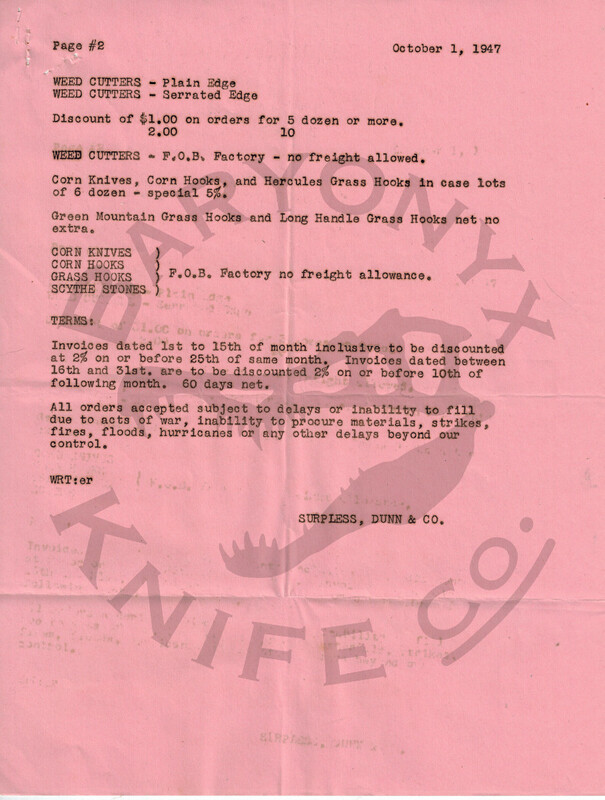 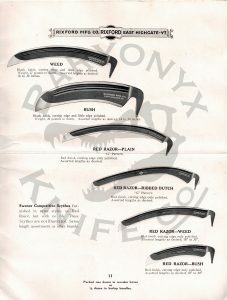 Check them both out at www.BaryonyxKnife.com!